Ottomans in Crete | The British in Crete, 1896 to 1913. 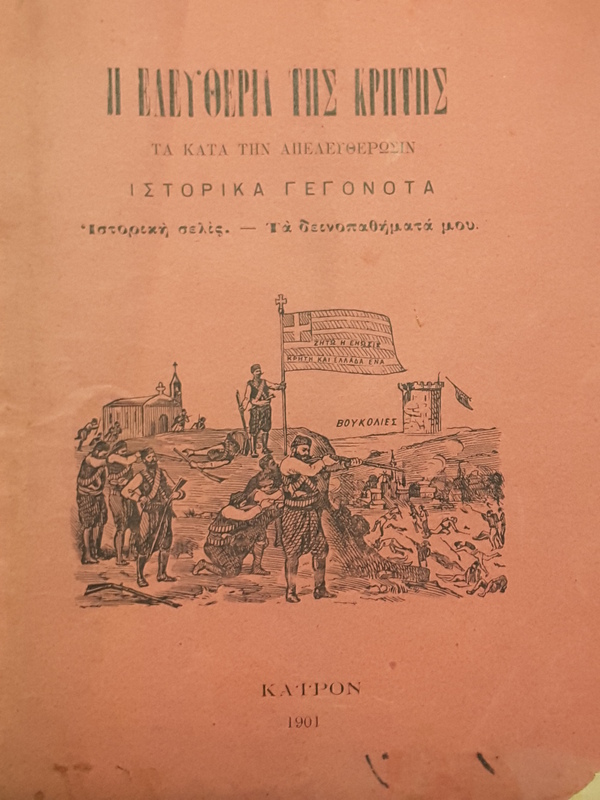 The capture by Cretan Christian insurgents supported by Greek troops, of the watch towerat Voukolies, to the west of Canea, on the night of 6/7 February 1897, while giving the insurgents a needed boost to their morale, also demonstrated the relatiive ineffectiveness of any Eurropean military response to the insurrection. 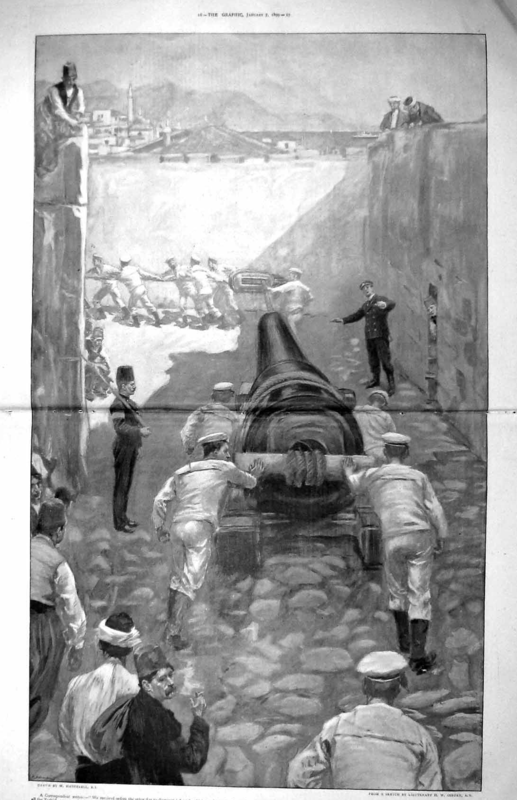 While the European Powers could, and did, by virtue of their naval forces, command the littoral, once out of the range of the naval guns, there was little that could be done to support Ottoman positions. This dilema was to occur again when, in 1897, British troops occupying Candia were forced to confine their operatioins to within six miles of the town. The fall of the Tower of Voukolies. This entry was posted in Cretan Rebels, Ottomans in Crete and tagged Crete 1897, European Intervention Crete, Tower of Voukolies, Voukolies on February 2, 2017 by Mick McT. ‘The question of artillery has given much trouble. It was obviously most undesirable to have guns left behind in the hands of the insurgents when the whole object of the Powers is to pacify the island. After much trouble and insistence on the part of the Admirals, four of the six guns stated by the Greeks to belong entirely to the Cretans are to be embarked with the Greek troops, the other two are said to be on Akrotiri, and the Admirals have made a peremptory condition that they also shall be taken away. In the end, the Royal Navy oversaw the evacuation of 6 field guns, 12 horses, 53 mules and 233 cases of artillery ammunition. 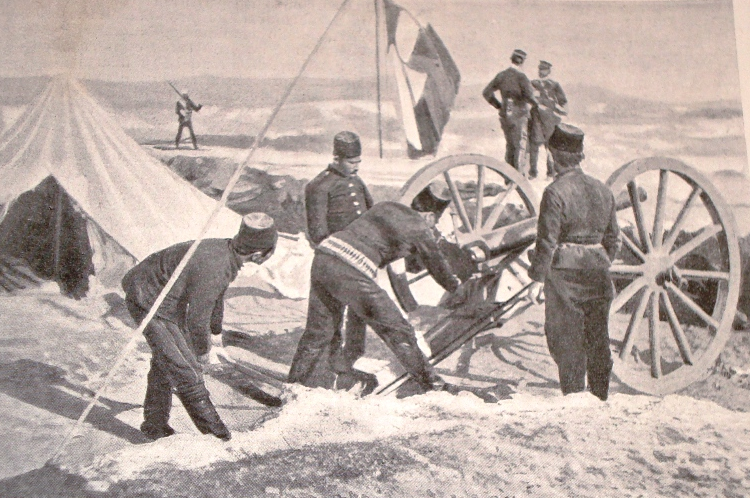 To counter the threat of Greek/Cretan Christian artillery, in the early stages of the Intervention, both the Powers and the Ottoman military supplied artillery to the island. 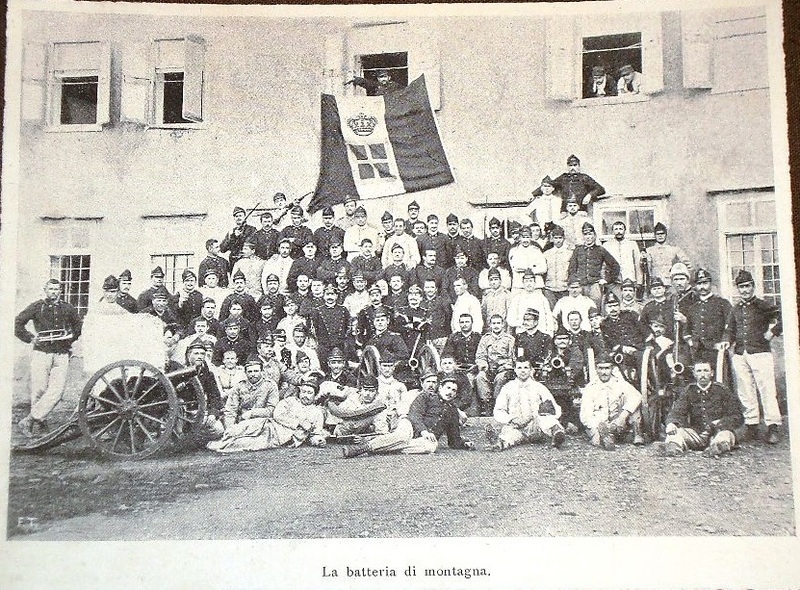 Ottoman field artillery beneath what appear to be an Italian flag. 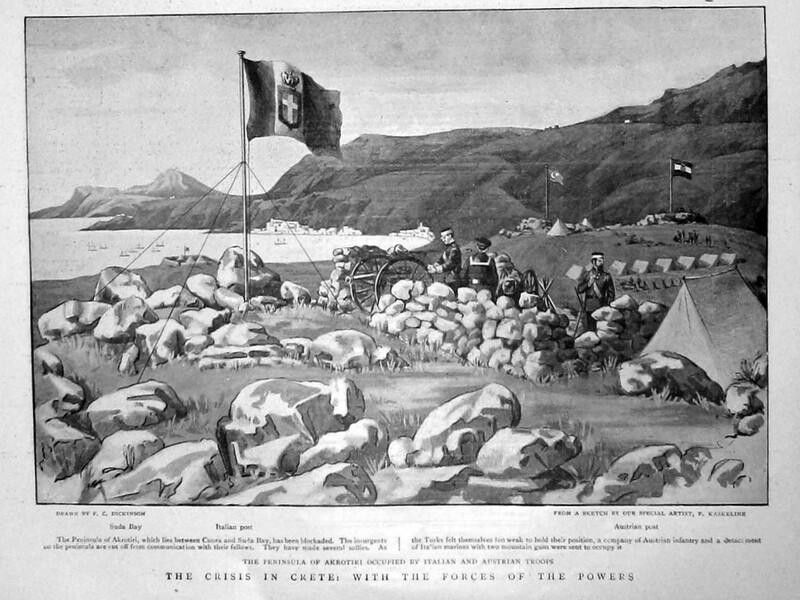 An illustration from an Italian magazine shows Ottoman artillery beneath what is apparently an Italian flag. 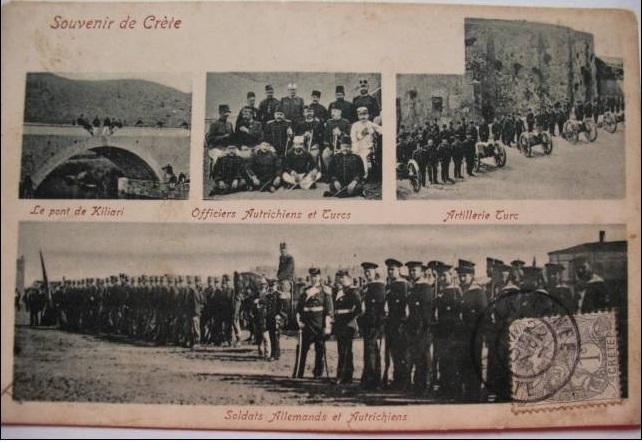 In addition to the Royal Artillery Mountain Battery stationed in Crete in the early stages of the Intervention, following the events in Candia in September 1896 the Royal Navy reinforced the town, landing field artillery. ADM116/116 Captain Sir R. Poole, HMS Hawke, to Rear-Admiral Harris. 20 May 1897. Donald J. Stocker, Jonathan A. Grant. Girding for Battle: The Arms Trade in a Global Perspective, 1815-1940. Greenwood Publishing Group, 2003, pp.31-32. NAM 6807-171. Diary of the detachment 1st BN. Seaforth Highlanders at Canea Crete During the early days of the international Occupation 1897. 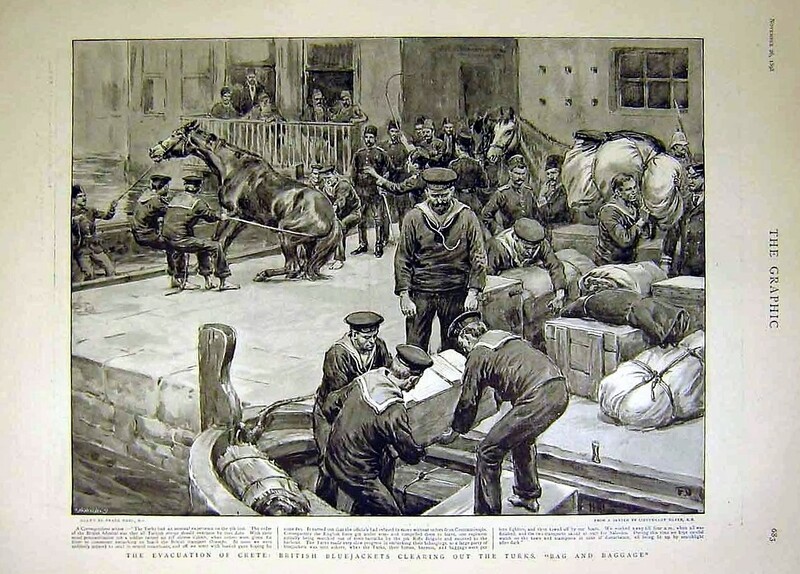 This entry was posted in British Army in Crete, European Intervention Crete, French troops, Greek Army in Crete, Ottomans in Crete, Royal Navy in Crete, Uncategorized and tagged Artillery Crete 1897, Crete 1897, Crete 1898, European Intervention Crete, Ottomans in Crete, Royal Artillery Crete 1897 on November 14, 2016 by Mick McT. 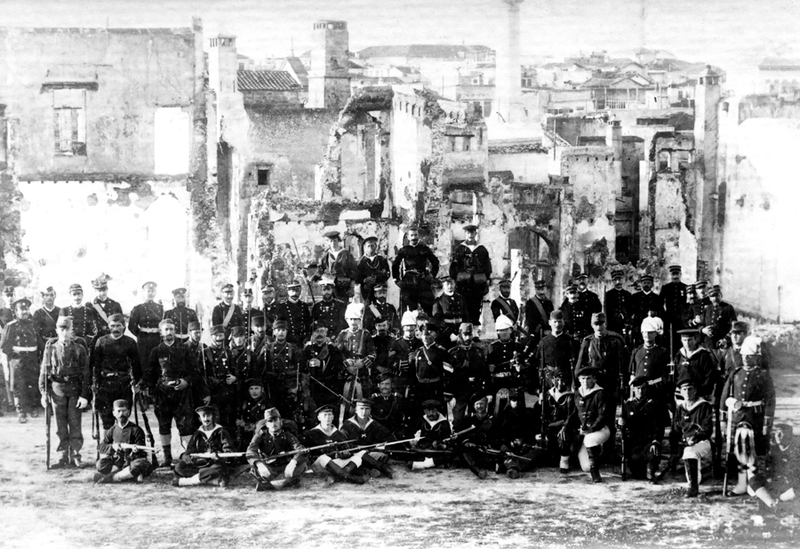 Following the riots in Candia in September 1898, the decision was finally taken to remove all Ottoman troops and officials from Crete. After an ultimatum issued by the Admirals controlling Crete was issued to the Ottoman authorities on the 4th October, the Porte prevaricated but on 23rd October the evacuation began, only to be halted by the 28th with some 8,000 Ottoman troops having left. The price for this delay, brought about to avoid Ottoman embarrassment during by the Kaiser’s visit to Constantinople, was to be high in terms of lost Ottoman prestige. 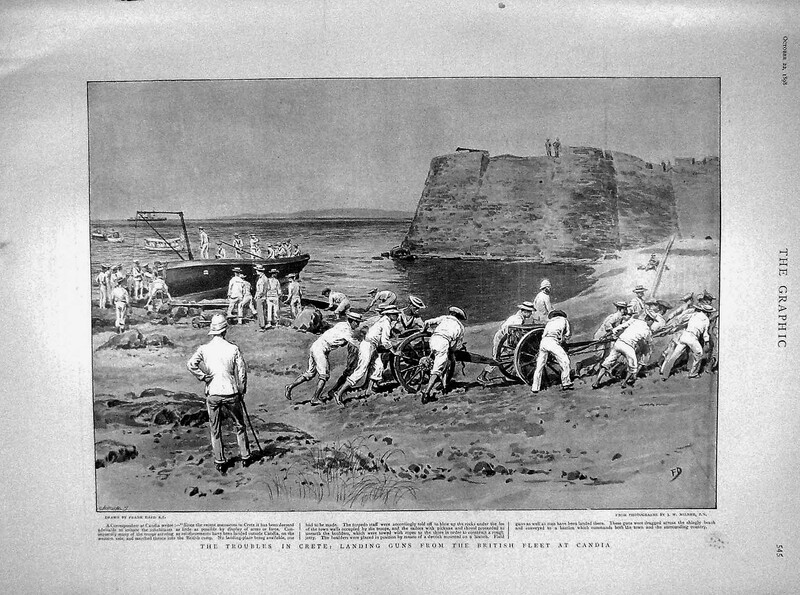 At the insistence of the British, in punishment for the delay in evacuation, the Sultan’s flag was to be hauled down in Canea and all troops were to leave the island by 5th November; in the event of them failing to do so the Powers would take steps to remove them and make the Porte pay indemnities for any damages caused in their removal. The Ottoman presence on Crete, which had commenced in 1645, was thus effectively terminated. 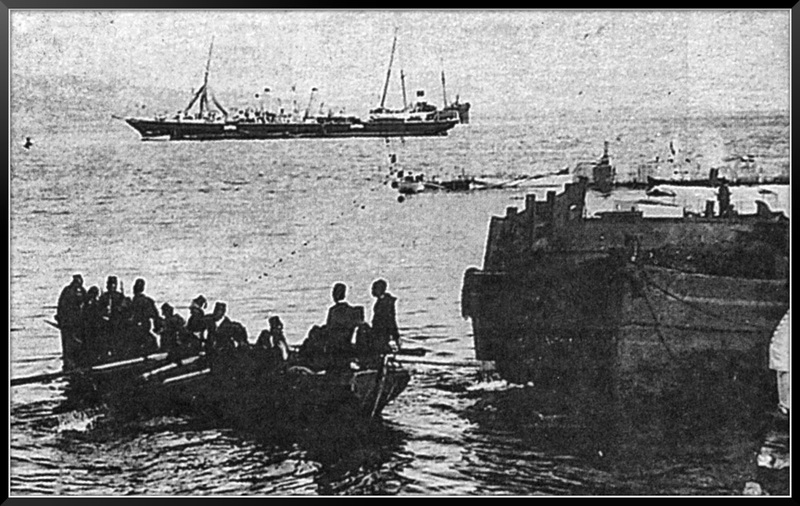 Ottoman Troops departing Suda Bay. November 1898. 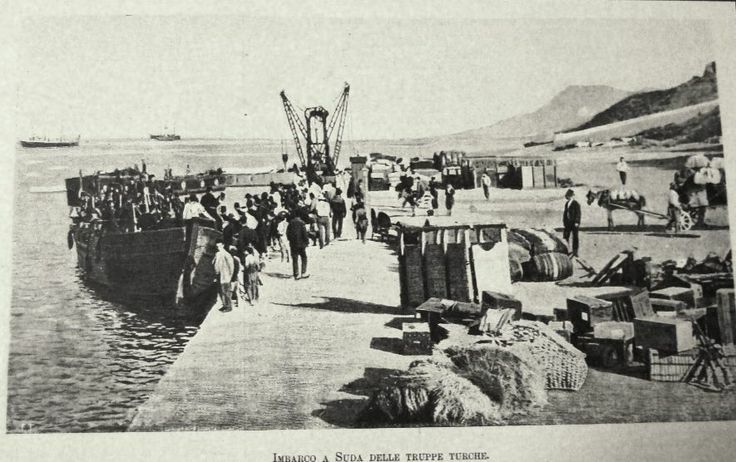 Ottoman troops departing (Suda bay?) November 1898. Ottoman Troops departing Irpetra. 1898. In reality however, the Ottoman military presence did not finally come to an end until several months later; a few men stayed behind to supervise the shipping of Ottoman munitions, and arguments were still continuing up until December as to the rank of the most senior Ottoman officer the Admirals would allow to superintend the operation. Şenişik, The Transformation of Ottoman Crete, 227. ADM 116/93, Vol. 2. Telegram No. 30 Chermside – no addressee. 4 November 1898. Ibid. Telegram No. 107. Biliotti to Constantinople Embassy, 5 November 1898. NFRA. St. George’s Gazette, November 30 1898, p. 183. Ibid. December 31 1898, p. 199. Turkey No. 1, 1899. No. 102. Noel to Admiralty, 1 December 1898. This entry was posted in European Intervention Crete, Ottomans in Crete and tagged Crete 1898, European Intervention Crete, Northumberland Fusiliers Crete 1898, Ottoman evacuation of Crete 1898, Ottoman soldiers, Ottomans in Crete, Royal Navy Crete 1898 on November 4, 2016 by Mick McT. An Azerbaijani take on Crete. The matter of Crete in the late 1890s wasn’t just of interest to the immediate players on the island, to Greece, the Ottoman Empire and Western Europe; it was also of interest to those within, and on, the borders of Iran and Russia. 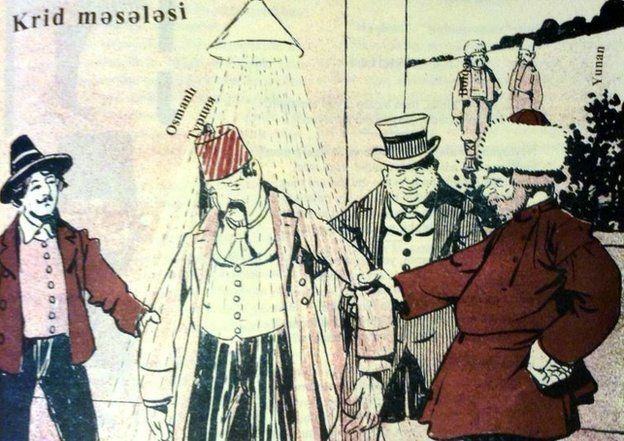 The cartoon below, “No need to get too hot”, was published in the Azerbaijani satirical magazine “Molla Naasreddin.” The cartoon shows Britain, Russia and, possibly, Italy, forcing the Ottoman Empire to take a shower by a sign saying, Krid Melelesi, which appears to translate from Turkish into the phrase ‘The Matter of Crete’. The image is undated but the magazine was set up in 1906 so it presumably relates to events post that date. This entry was posted in European Intervention Crete, Ottomans in Crete and tagged Azerbaijan cartoon Crete, European Intervention Crete, International troops in Crete on June 17, 2016 by Mick McT. International forces in Canea. April 1897. The British army troops are from 1/Seaforth Highlanders, in Crete from March 1897 to November that year. It’s difficult to make out from the photograph but given the number of Naval officers in the background, it’s more than likely that there are British marines and sailors in the shot. German, Austro-Hungarian and Ottoman troops. Crete c.1897. The postcard is stamped as being posted in 1904 in Canea. The Germans and Austro-Hungarians left Crete in early 1898 and the Ottomans were evicted in late 1898, so there’s a good chance the photographs date from 1897/1898. probably taken in the Canea/Suda Bay area. 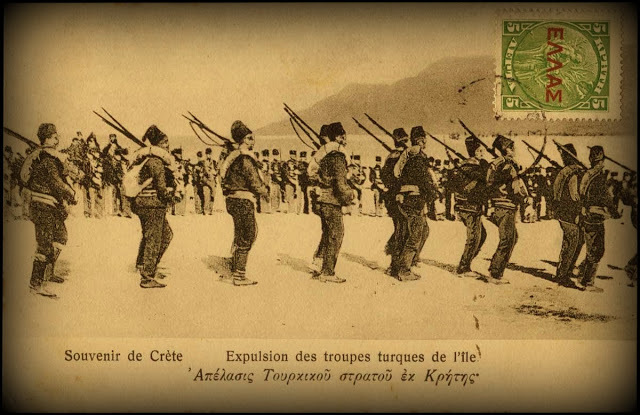 This entry was posted in British Army in Crete, European Intervention Crete, French troops, German troops, Ottomans in Crete, Royal Navy in Crete, Russian troops, Seaforth Highlanders and tagged Austro-Hungarian troops Crete 1897, Crete 1897, European Intervention Crete, French troops Crete 1897, International troops, Italian troops Crete 1897, Ottomans in Crete, Royal Marines, Seaforth Highlanders on December 12, 2015 by Mick McT. On October 4th 1898 the Council of European Admirals, then effectively ruling Crete, gave the Ottoman authorities one month in which to evacuate all Ottoman troops from the island. The Porte having earlier the previous year, and with great reluctance, accepted that Crete was ultimately to be an Autonomous State, agreed to the evacuation in principle, but objected to both the time table and the detailed terms; the Sultan wanting to retain a small force to guard the Ottoman flag. From British records, it’s clear that the various European governments were prepared to compromise to some extent on the Porte’s response, provided that sooner rather than later, the Ottomans left. By way of preparation for an attack on Candia plans were drawn up which would involve the British forces outside the town, if not previously withdrawn into the town, to concentrate and, in a delicious irony, supported by Cretan Christian insurgents who the British had originally come to suppress, withdraw to the coast where they would be re-embarked. 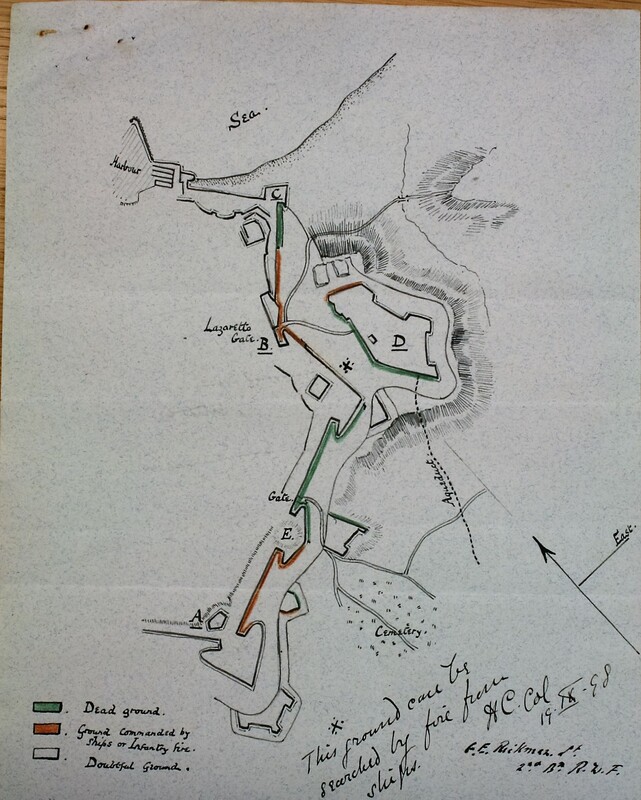 The action to be taken In Candia would include the bombardment of the town, and to this end, detailed maps were drawn up showing the likely fields of fire covered by the guns of the Royal Navy and the British infantry. Map of Candia showing fields of fire. The delay in meeting the November 4th deadline, albeit by a day or two, did however, have consequences. 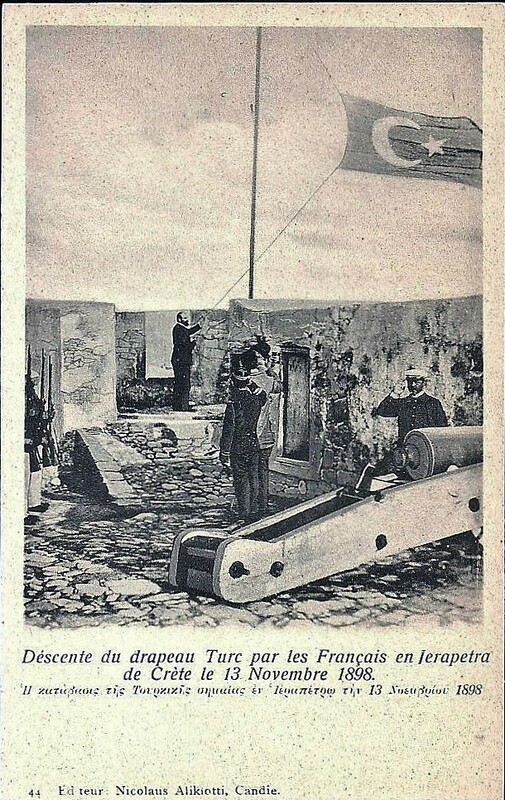 The Ottoman flag, which under the terms of the settlement granting Crete Autonomy was supposed to remain flying, was hauled down in Candia and wasn’t raised again until later that month. When it was finally reinstated, in a clear demonstration of where the power on the island actually lay, it was raised and protected by European troops, while, simultaneously, a proclamation was issued guaranteeing European protection to Cretan Muslims. 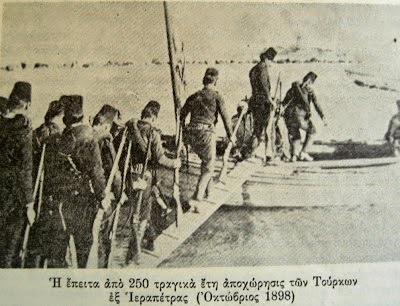 However, while technically, the last Ottoman troops left Crete on 6th November, a few men did remain behind to supervise the shipping of Ottoman stores and munitions and as late as December that year, arguments were still taking place as to the rank of the Ottoman soldiers who would be allowed to remain; the Ottomans wanting to send a Colonel, the Admirals insisting that no one over the rank of Captain be allowed to remain. This entry was posted in British Army in Crete, European Intervention Crete, Ottomans in Crete, Royal Navy in Crete and tagged Crete 1898, European Intervention Crete, Ottoman evacuation Crete 1898, Ottoman flag, Ottomans in Crete on November 5, 2015 by Mick McT. Inter-communal violence… good for chocolate sales. 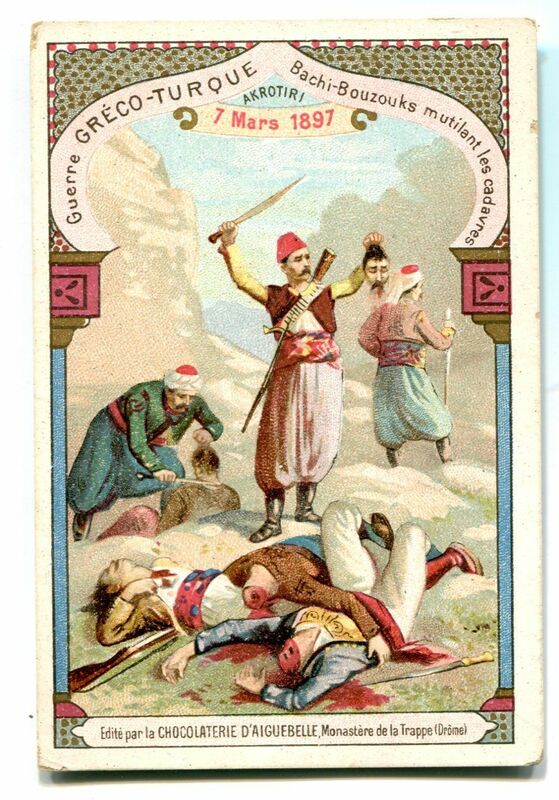 Bashi-bazouks mutilating corpses. 7th March 1897. 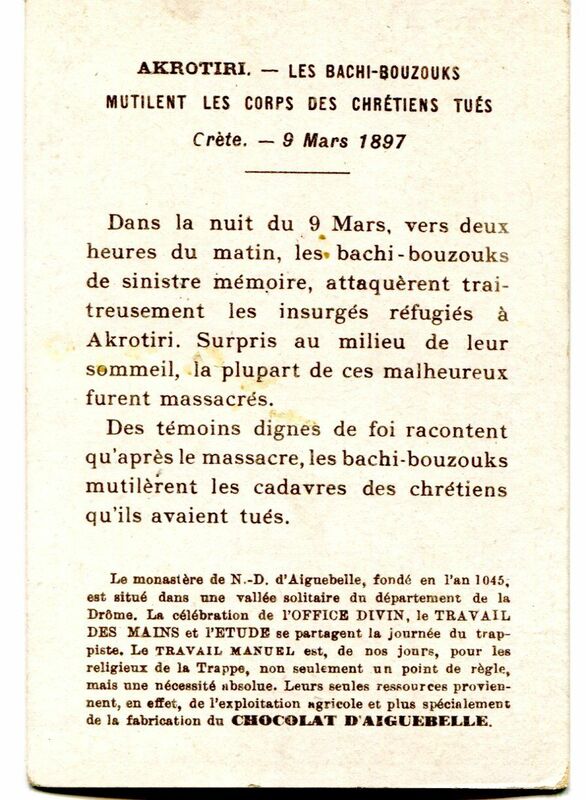 Shown above are both sides of a trading card purporting to show Cretan Muslim Bashi – bazouks – irregular volunteers – mutilating the bodies of Cretan Christians in Canea in March 1897. The attacks on Cretan Christians which took place at the time, and subsequent the burning of a large part of the capital, Canea, were the incidents that lead to the beginning of the European Intervention on Crete; the landing of European sailors and marines. Seemingly, in the late 1890s, graphic depictions of violence were deemed suitable for the selling of chocolate: The cards were issued by a French chocolate company; one originally founded by Trappist monks. More rather violent chocolate cards, followed by some pretty birds, 1/3 down the page here. This entry was posted in European Intervention Crete, Ottomans in Crete and tagged Bashi-bazouks, Crete 1897 on September 22, 2015 by Mick McT.